After winning their opening three league games of the season, Manchester United’s form has dipped alarmingly, with three defeats and a single victory in their last six league games, culminating in an embarrassing defeat for Jose Mourinho at Stamford Bridge last Sunday afternoon. But whilst shambolic defending was the main reason for defeat against Chelsea, of equal concern to Mourinho will be that the Old Trafford club have now failed to score a goal in 200 minutes of Premier League football and with almost a quarter of the season gone, United languish in seventh place, with a gap of six points to their neighbours who head the table. SportsMatrix examined Manchester United’s opening nine league games under Jose Mourinho with the first nine games of Louis van Gaal’s final season at Old Trafford. The quality of opponents in those games was similar to the ones played this season; yet under van Gaal the Red Devils were five points better off, had scored more and conceded fewer goals. 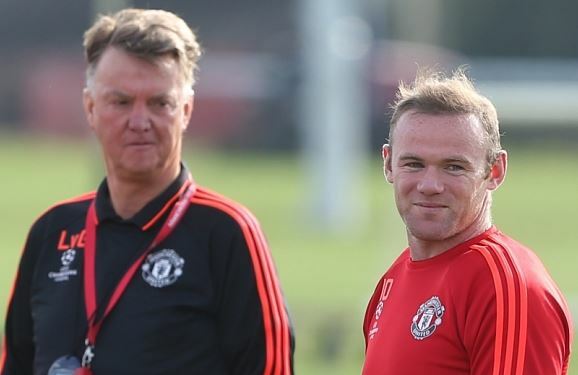 Under van Gaal, Manchester United were accused of focusing too much on possession. Mourinho has changed that style, reflected in a reduction in the average number of United attacks per game (77.2 last season down to 69.2 this season). There has been less emphasis on passing, down from 55.8% to 47.4%, but with a slight increase in dribbling. But whereas last season United looked to pass their way through defences, this season there has been a significantly greater emphasis on crossing (an 43% increase), both from open play and from set pieces. The average number of set piece crosses delivered per game has increased from 4.3 to 7.1, with the percentage of crosses leading to a threat on goal increasing from 10% last season to 23% this season. 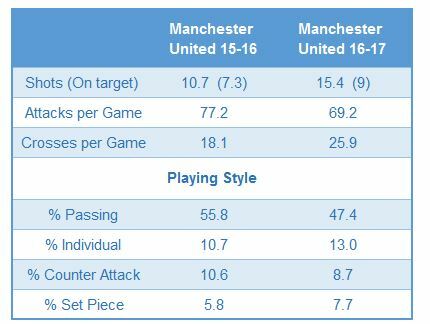 But whilst they may pose a greater set piece threat, United’s crossing from open play has been far less effective. On average they are delivering approximately five more open play crosses per game this season than last; but the threat from these crosses has declined (17%) compared to last season’s open play crosses (22%). Even with all of their summer spending, Mourinho’s team have been less dangerous in front of goal, despite averaging almost five shots more per game (15.4) than last season (10.7) and despite averaging more on-target shots per game; but when converted into goals, Mourinho’s United have found the net 12 times compared to 15 times under van Gaal. Jose Mourinho will be smarting after his latest defeat, but despite a poor start to the season will have no doubts in his ability to turn things around quickly and ensure that Manchester United will soon be closing in on the clubs at the top of the league.